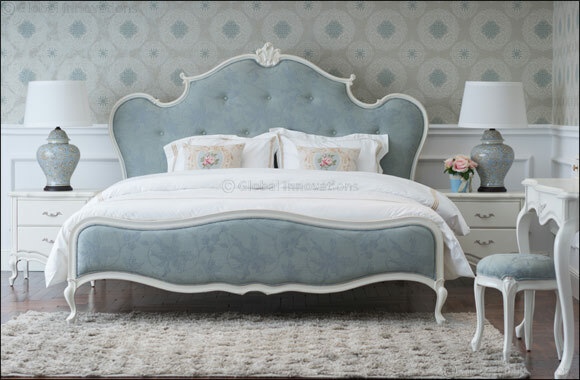 Dubai, UAE; February 13, 2018: 2XL Furniture and Home Décor, UAE’s homegrown retailer for luxury furnishings, has launched its new Malmo Bed in light blue with floral motifs, to turn the bedroom into a place of peaceful retreat. The bed features a white frame with wooden curved legs. The Malmo Bed is made of medium density fiber board. The cushioned headboard features floral motifs for that feeling of serenity and peace. Most importantly, it is perfect for comfortably sitting up for a late-night chat or reading your favorite book. The Malmo Bed is available for AED 6,744, the night stand for AED 2,139 and the mirror for AED 3,171.